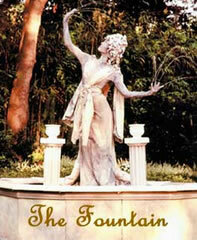 With magical elegance, a statue of a young woman slowly animates into a living fountain. Delicate jets of water appear from her fingers as she moves in and out of various tableaus. A bell-like cascade emerges from her head in this beautifully choreographed display. The Fountain is a truly enchanting experience. Fountain performer comes with fountain set as shown (faux marble surround and two columns). requires 16 x 16 area within 150 feet of water and 2 – 20 amp circuits. Performance can be adapted to existing pool or fountain at performance venue pending approval of Artist. HUMAN FOUNTAIN - VIDEO 1 from Talent Screening Room on Vimeo. HUMAN FOUNTAIN - VIDEO 2 from Talent Screening Room on Vimeo. HUMAN FOUNTAIN - VIDEO 3 from Talent Screening Room on Vimeo.